I was having so much fun playing with this Bath Time set yesterday that I decided to just go ahead and make two cards. 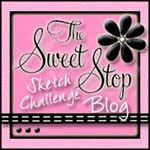 The colors are from the girls over on the Crazy 4 Challenges blog. The right side of the red DP and scallop are up on foam tape so it's level with the cork. I added some Stickles to the bubbles on all three circles. ....and please ignore the little dog hair on the card. Oops! It's been removed but I'm too lazy to retake the picture, lol! This is so cute! GREAT layout! This card is adorable!!! Love it!! Makes me giggle! Love it! Awwww, so cute! I love all the creative ways you use cork. I really need to use mine sometime. This is just DARLING!! The coloring is beautiful, that set is too cute! I love that little duck, the bear is cute too, onto my wish list. There is just something about ducks when drawn in a whimsical way that is enduring. Love your card! Hi ~ I found your blog by way of Chris Olsen. I have spent the last few hours just drooling over all of your work on your blog. I just LOVE your style. So glad to have found you. I'm a follower now. Thanks for all the inspiration!! I especially liked the stray dog hair. Not that your dog is stray - oh no no no. The stray hair. Every card ought to have a little errant hair. Amazing the details we miss when photographing our subjects and then they are suddenly higlighted on the screen. Super cute! I just love the design/sketch! Plus those little ducks are too cute! This is super duper cute, I love it! Why is it that we don't ever see this little details until AFTER the picture has been taken! LOL! I do the same thing! Love the little ducks, Denise. Too, too cute! So cute!The touch of cork is perfect! Very cool use of the cork as well! LOVE this Denise! These little guys are SUPER cute and I LOVE the layout with the cork!!! OMGosh isn't this just ADORABLE!!! Love your little duckies and your awesome colouring!!!! Awww... I love this!! Those ducks are too cute!! I love the cork in this layout too!! OMG these little duckies are TOO stinkin' cute, Denise! What a cute card and awesome concept! LOVE this! What a darling card, I love little duckies! Oh, now this is just waaaaaaay cute Denise!! Love those bubblin' lil' duckies!! And the sketch is fabulous! Your little ducks are sooo cute, Denise, and I LOOOVE how you used the cork!!! I have several sheets of cork sitting right here and I haven't even cut into it yet...how crazy is that!!??!! K...soon as you said ignore the little dog hair I had to go look for it...otherwise I would have never noticed it LOL! This is adorable! I love the repetition of the ducks...too cute! AW! Look at the sweet little duckies!! Too cute Denise. The layout is beautiful!! Clever use of the cork!! Simply adorable with all those little ducks splashing around! Love the dewdrops!! What cute little duckies Denise! the cork is a perfect material to frame them in!